$99 per night (King Studios) + tax. Breakfast is included with hotel rooms. Rooms are available August 7-11, 2019. A small amount of smoking rooms are available, but the majority of rooms are non-smoking. Note about tax exemption: If you plan to use a tax exemption form for your stay, the exemption form will need to be provided ahead of time or during the check-in process. The hotel will no longer remove state taxes after the guest has checked out. 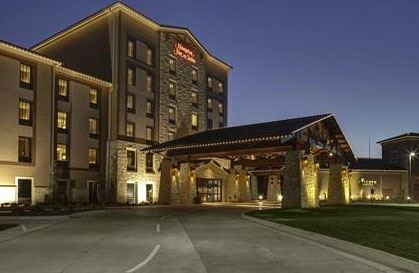 To make a reservation by phone, please call the Hampton Inn & Suites at 316-524-3777 and mention the KEMSA rate. Or Make a reservation online here. 1. On July 20, all reservations will be charged for the first night as a deposit for your room. The additional nights will be charged after your stay. If you cancel a room on July 19 or before, there will be no penalties. After July 20, your first night's deposit will be non-refundable. KEMSA implemented this policy to allow for more people to get into the conference room block without so many last minute cancellations. Please cancel extra rooms before July 19 or plan to share a room if possible. 2. Once the block fills up, the hotel WILL NOT have a waiting list. You will need to call back occasionally and see if rooms have become available. If you would like to make a reservation at another hotel, we have provided a few options for you below. We don't currently have room block agreements with them, but you are welcome to call them for a reservation. Reservations are the attendee's responsibility. The conference hotel reservation deadline is July 19 or whenever the block sells out. We cannot guarantee room rates or availability after the deadline or after the block sells out. KEMSA does not currently have a block of rooms at these hotels. If our conference hotel block sells out, we will look into this. For reservations, call: 316-558-8001 or book online here.